One thing we eat here a lot (and I mean lots) is cheese. The ones most often eaten are probably medium or mild cheddar, mozzarella and Swiss. Every once in awhile I like to expand our tastes and buy other flavored cheeses like Havarti, Monterrey jack and pepper flaked cheese. When I first began cooking and baking I was amazed at the amounts of different types of cheeses you could actually purchase. (I always thought that Monty Python sketch bout the cheeses was a joke…) and I sometimes still am. There are certain cheeses that I will NEVER try (headcheese for one, not bashing anyone who does like it) and others I simply cannot get enough of (cheddar, old, thank you). 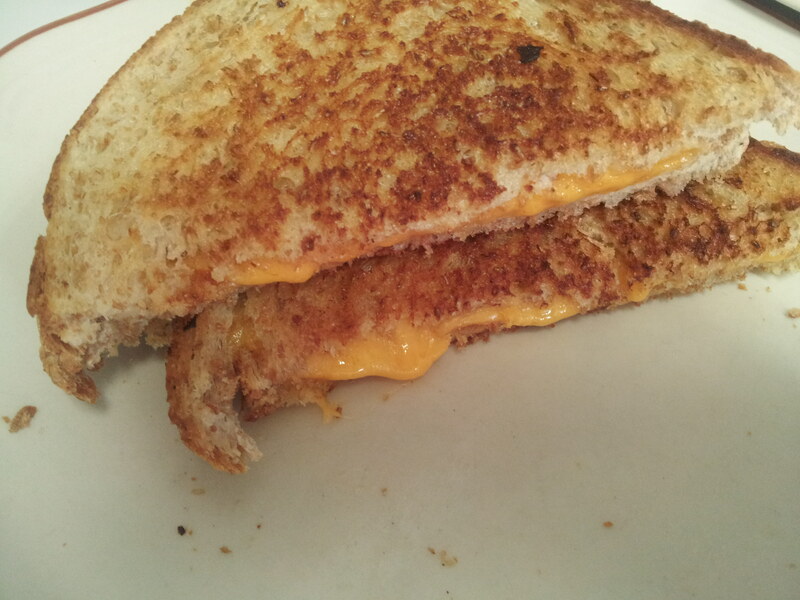 One thing that everyone can agree on for almost any meal is grilled cheese sandwiches, open or closed, with soup. I will often make this on cold winter days for a nice hot lunch, or for a quick easy meal that won’t heat up the kitchen too much during the hot hot summer months. Since we eat it so often, I try to change up the sandwiches often adding tomatoes, pickles, onions (raw or slightly fries) green and/or red peppers. I also add different sauce/spreads to the sandwiches like mayonnaise and different salad dressings (usually creamy ones like ranch). Use different cheeses: cheddar, mozzarella, Havarti, monteray jack, Swiss or a mixture of one or more cheeses. processed cheeses even come in many flavors if you prefer not to have to slice cheese. (deli area in the grocery store also usually has pre-sliced “real” cheese. Add meats to your sandwich, like ham, pepperoni, chicken or turkey slices, bacon or anything else you want to put into a sandwich. 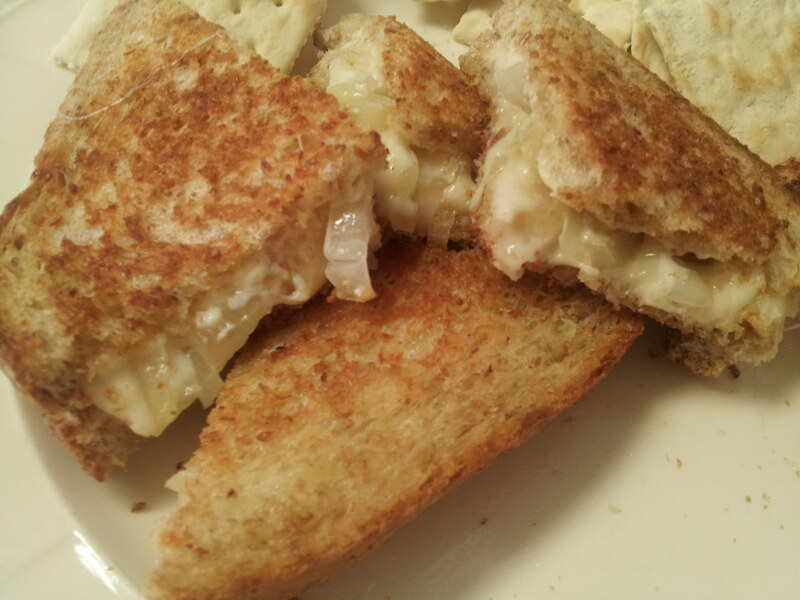 Enjoy the different combinations you can make, and please feel free to post your own grilled cheese creations. a couple of the decorated cupcakes..they didn’t last long! I love to make things fun for everyone, whenever I can. 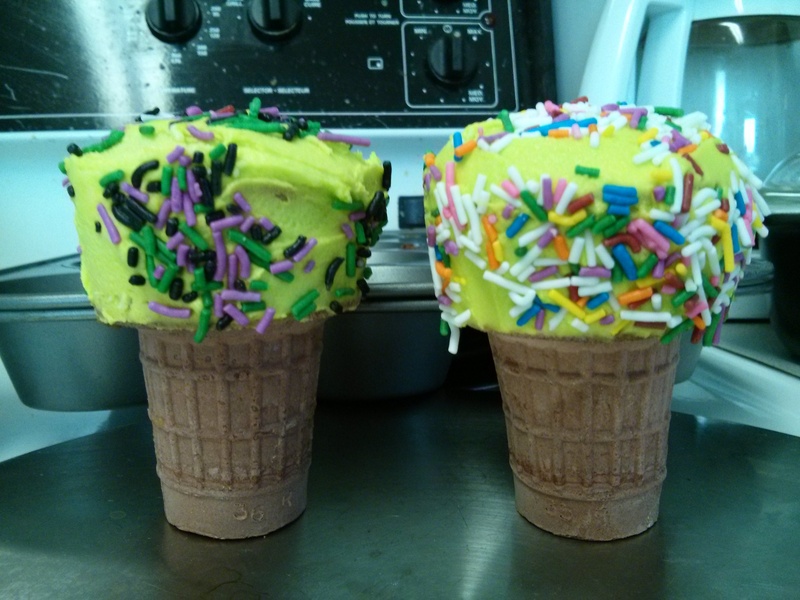 With cupcakes, it’s almost hard to make them more fun, but this time around I decided to bring back an old classic of baking them into ice cream cones. (thank you to my friend for posting the idea on her FB page that reminded me of this gem). Now, you can do this the easy way and just go buy a prepackaged mix and pour the batter into the cones and bake as directed for cupcakes. 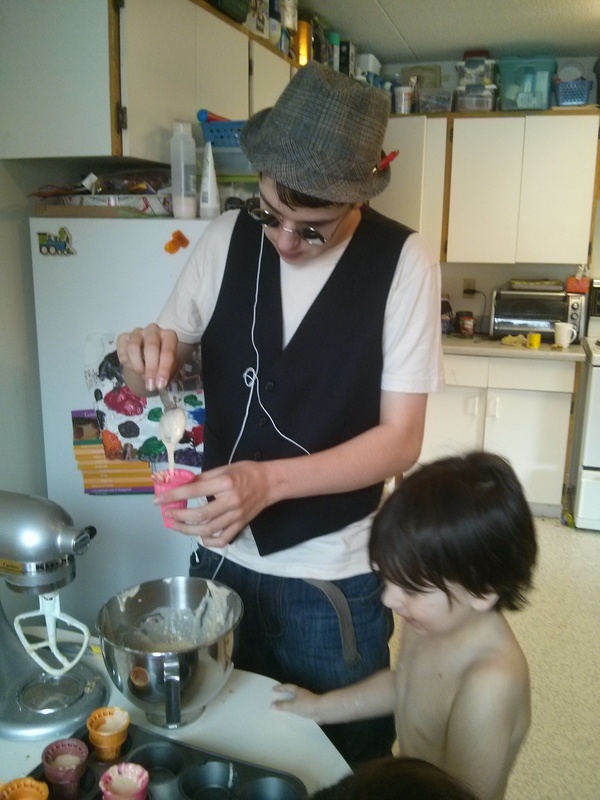 But at our house I like to experiment (really) and decided to make my own cake batter. As usual, I took a recipe from a book I have, this time from the one provided to me when I bought my handy dandy mixer. It’s like having a second set of hands in the kitchen with me. I used an easy yellow cake recipe, modifying it slightly to use 1/2 whole wheat flour and flax seed as a replacement for some of the eggs. 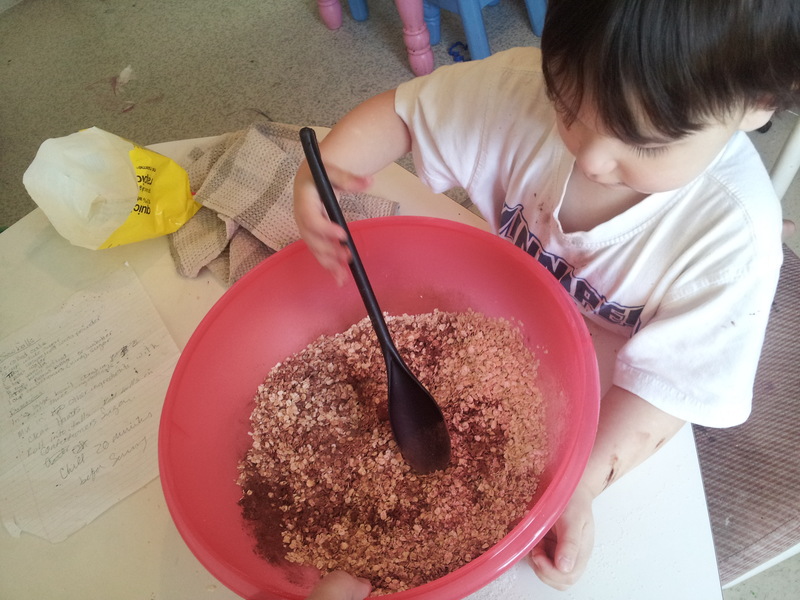 When I have the children helping, I sometimes like to gather all the ingredients first and measure some of them so all we have to do is add what we need to the bowl when we need it. 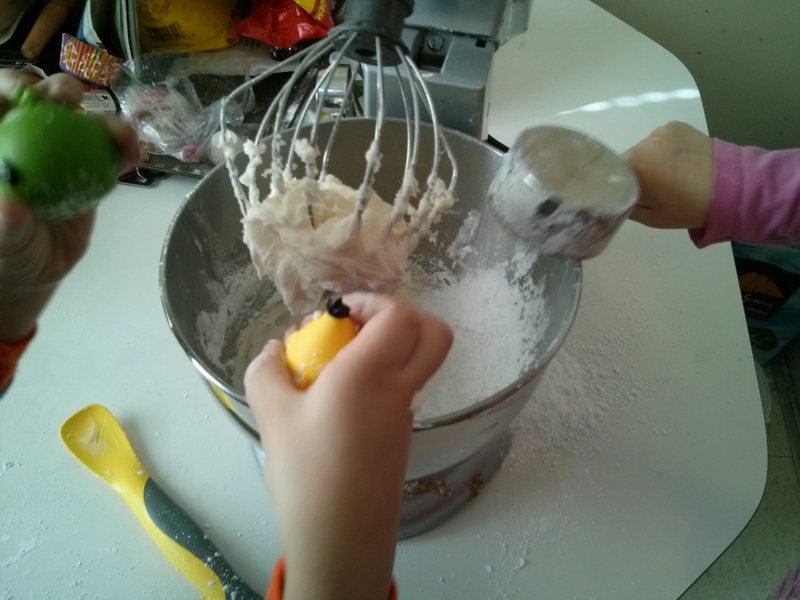 With my little helping hands cracking eggs and pouring the sugar, we added all the ingredients to the mixing bowl and watched as it worked hard. When the batter was mixed, we all took turns spooning the batter into ice cream cones that my sweet DD had picked out at the store earlier. I think I filled them too little, just over the first ledge in the cone. next time I will try filling them just slightly more, to about 1.5 cm below the rim. I placed them in a muffin tin to help keep them balanced and baked them the same way I do cupcakes. They turned out great, and even though the decorating and eating took a couple of days (we decorated this time as we ate) they were a big hit. Definitely trying this one again with different sorts of cones and batters. One of the easiest and tastiest recipes I use is from a cook book I have called Basic Shelf Cookbook. I swear, this book has been a lifesaver over the years, especially on my journey to find easy ways to save money on our grocery bill. I try to cook everything we eat from scratch, and although some of our foods come from cans (veggies and fruits) most of it is healthy and tries to incorporate at least 3 of the food groups. 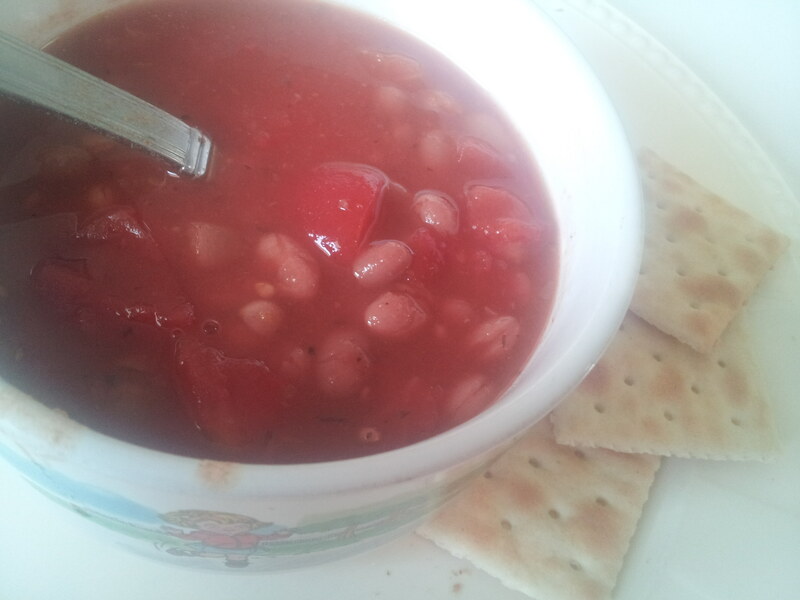 1 large can (798 ml) of diced tomatoes, or about 3 1/2 cups if you use fresh. I use the one with spices already added. salt and pepper to taste. you can also add other herbs and spices to your liking, such as parsley, Italian seasoning or garlic. Mix all together in a large saucepan and bring to a boil. Simmer for about 15 minutes and serve with grated cheese on top. I also usually serve with garlic bread (with garlic spread from scratch) or sandwiches. 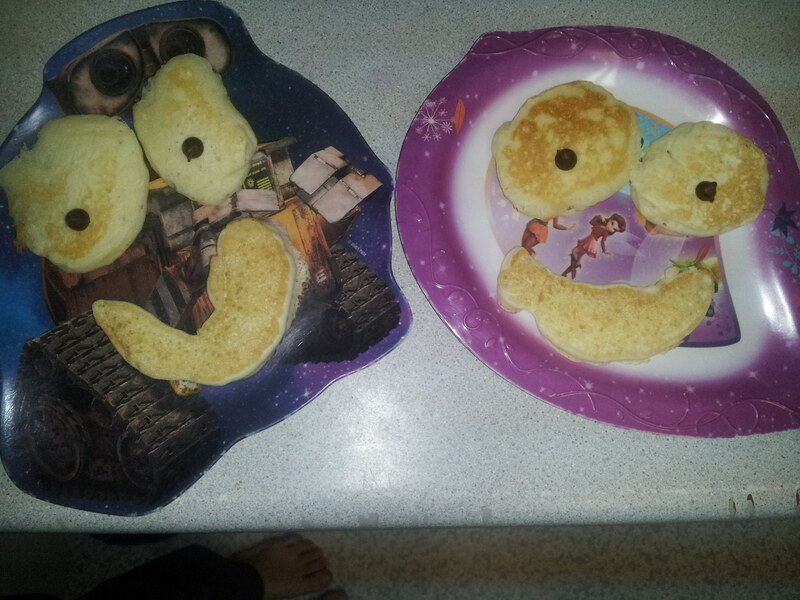 The kids ask me to make pancakes so often I have the recipe memorized and doubled. I also ALWAYS make sure to have the ingredients on hand to make them at all times. 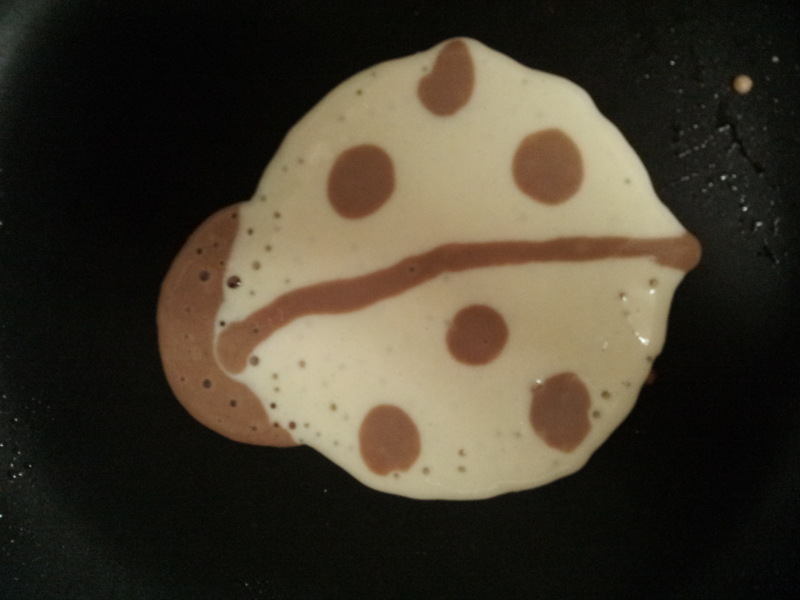 I recently decided that the children should all learn to make the pancakes now, from beginning to end. Of course, my sweet DD wanted to help me first, and so it began. 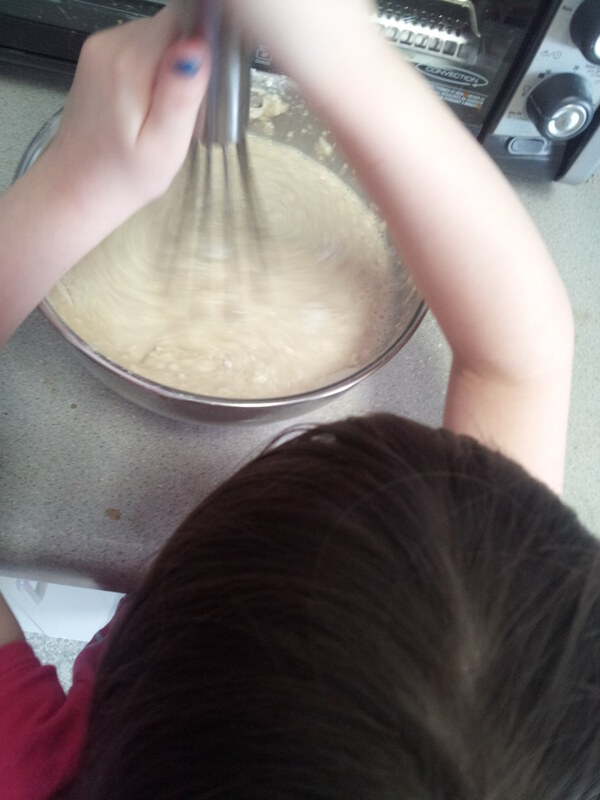 I had her gather all the ingredients that I needed- eggs, oil, milk, flour, baking powder, salt and sugar. 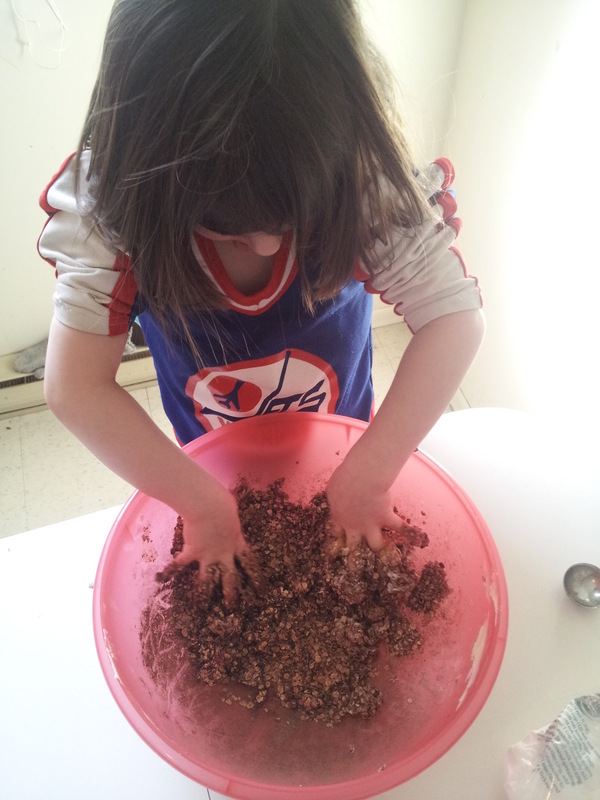 I measured the wet ingredients, and the dry ingredients this time and let her mix them up herself. 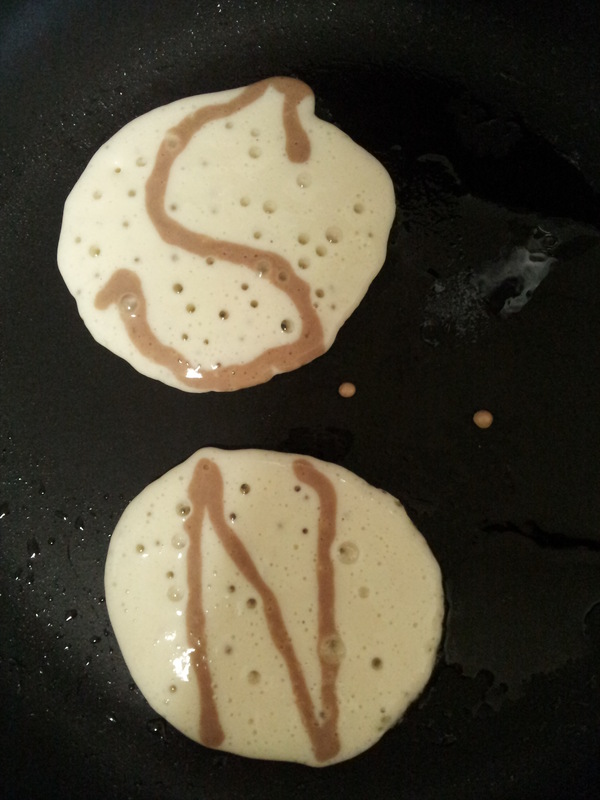 After a little mixing, I showed her how to test the pan for readiness by making cold water spatter on the pan. When the water dances, it’s hot enough. 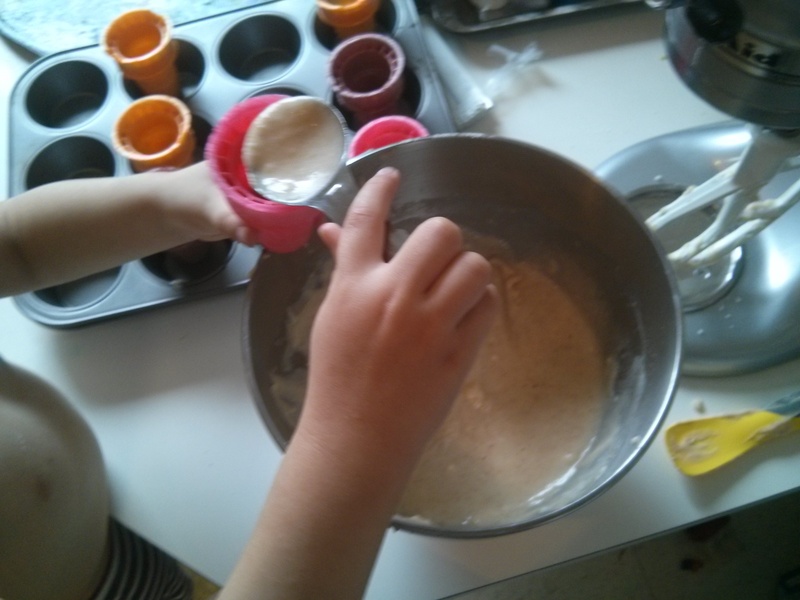 This time, I let her watch carefully while I poured the batter onto the hot pan and waited while the little bubbles formed on the top, letting us know it was time to flip them over. I then flipped them, and let them cook the rest of the way and removed them from the pan myself. yummy way to learn letters! I think next time, she might be ready to pour the batter herself, and after trying that if she wants to I’ll let her flip them. Yes, at the young age of five. And with any luck, her big brother will learn to make them in one go, and I’ll get a nice pancake breakfast for mother’s day, sans mother’s help. 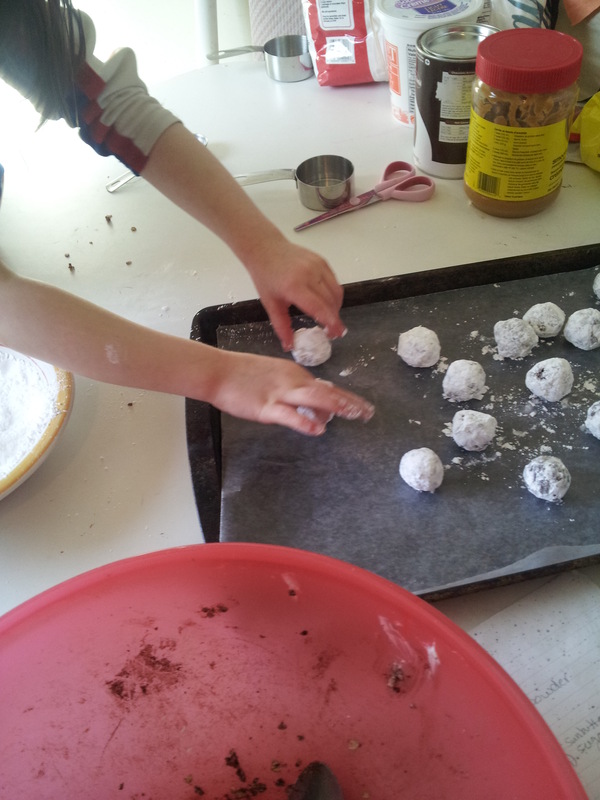 Baking with kids can be challenging, but in the end the “training” will be worth it. Hello! I am writing this as my two youngest play inside their “new” (to us) Thomas the tank Engine tent/tunnel. They are pretending to be the driver, and passengers are the stuffed animals they collect along the way. The oldest is yet again visiting with his great grandpa, and as I look around the mess we call home I am thankful. I am thankful that I have a mess to clean, thankful that I know that as the messes are being made, so are memories. They learn so much through play, and as I see them learning with each other how to get along I know I am doing the right thing. We are home schoolers, life learners, “unschoolers” and welcome to our journey. I let the children lead the way, and follow along, sometimes not knowing the outcome, sometimes figuring the outcome and always learning right along side them. Some people might think that means unparenting, or not giving the kids an education. Although in some situations there may be a neglect in some way, the way we do it is definitely rich in many ways. We provide books, videos, internet, board games, puzzles, hands on crafts, writing, drawing, painting, outings and most of all free play. We bring the kids camping and to play outside. We watch birds, noticing when the seasons change the honk of geese in the air (we are due to hear them again anytime now, signalling the for sure sign of spring finally coming). We learn about growing our own food by gardening on our small balcony. My children know where our meat comes from beyond the grocery store, even though we live in a large city. Sometimes it looks as though we don’t do anything, that we just “play all day”. Well, what else are children supposed to be doing? Play is their work, and right now, their play is my work, too. Have fun and enjoy the great times childhood can bring. In an attempt to make our food and family more healthy, and to try and get in more pulse foods (such as beans and lentils) I am trying an experiment using pulses in my cookie recipes. Starting with a basic drop cookie dough adapted slightly from a recipe I found in an old cook book series, I am going to try to replace eggs, fats and sugars with alternatives without altering the taste too much. Which cookie dough will be best, or will I wind up creating my own in the process? This is one experiment I am attempting on my own, but be assured the children will be part of the taste test crew, as well as baking crew on various other projects. The first basic dough I used was a simple drop cookie dough, chocolate chip. I imagine these will be hard to keep the original flavor, as there aren’t many flavors in them to begin with, unlike other cookies that may have spices to liven them up and change the taste (and maybe cover up any not so good or different tastes). I started the usual way, by creaming together the sugars and margarine. Usually I will add the eggs next, but I accidentally started adding the dry ingredients before the eggs. Lucky for me, the dough still turned out great. I then add the dry ingredients in three small batches, and mix fully. Finally I add the chocolate chips (or whatever other chip I may be using for the cookie) and drop by spoonfuls onto prepared baking sheets. I usually use parchment paper to help keep clean up quick and easy, and I also find my cookies bake more evenly on the bottom. I will also be posting links to my youtube videos with how I did it. I hope you enjoy this first in a series of Great Baking Experiments.